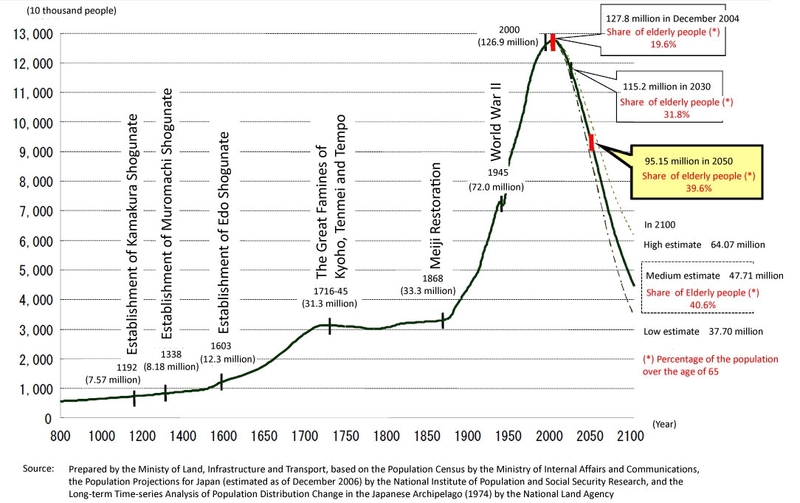 Japan’s population is declining at a rapid rate as the average age of its citizens climbs. Having peaked at nearly 128 million people in 2004, when those aged 65 or over comprised about 20%, the population is expected to drop to 95 million by 2050, when the share of senior citizens will be about 40%. And the rate is increasing, with 2012 marking the steepest drop ever for the second straight year, with deaths outpacing births by 205,000. For the first time, the proportion of elderly 65 and over surpassed the number of youths age 14 and under, in all 47 prefectures. The near and medium term implications of this change are mounting. With elderly farmers dying off and those remaining having more difficulty being alone, there continues a flight to urban centers. Tokyo, Osaka, and Nagoya now host nearly half the entire population. If government agricultural subsidies are cut from passage of the TPP trade agreement, it is sobering to think of what that will do to the remaining small farmers and their land. The government already spends over a third of its income supporting the elderly. But can this huge outlay continue? After all, in 1965 there were nine workers paying taxes for every retired person. Now there are just two. Everywhere one looks across society there are impacts to be seen, economic, social, environmental. To be sure, a falling population will require less energy and consume fewer resources, but one wonders what kind of infrastructure will meet the remaining demand. Hopefully it will be a relatively soft landing, but the risks of it being hard, or at least turbulent, are huge. In any case, the scale and nature of this demographic transition is unprecedented in the world. I believe this is the first time a highly industrialized country has faced such a persistent and profound decrease in population. And when taking into account all of its attendant challenges and implications, it is an open question whether this unfolding could possibly result in a resurgence of satoyama spirit – albeit decades hence, when the population returns to Edo-era numbers. One can only hope. Given the inherently un-sustainable nature of nuclear power generation – to say nothing of its profound lack of resilience – I have no doubt that the future of Japan, and indeed the world, will ultimately be nuclear free, perhaps within mere decades (albeit with residual nuclear contamination persisting for tens of thousands of years, well into the “Long Now”). Inspired by the quickening pace of change occurring in Japan and around the world, a few weeks ago I began drafting a blog post tentatively titled, “Japan as Number One, Again?” in which I argue (as I have in previous posts – for example, here) why I believe that Japan is poised to once again become a world leader, not in conventional economic terms of course, but in something more elusive and subtle, but ultimately more important.